—Astrotrain, The Transformers, "The God Gambit"
Humongous Mecha are awesome, in a very literal sense. They typically have more armor than a battleship, possess enough firepower to lay waste to cities, and tower over the battlefield like gods of war. When this awe leads to worship, you end up with the First Church of Mecha, in which these war machines are hailed as gods, or even praised as a deity in a full-blown religion. In some settings, these giant fighting robots may actually be gods. May involve a Cargo Cult or God Guise. This trope often overlaps with Merchandise-Driven, specifically when an author who wants to write fantasy lore ends up with a sponsor who wants to sell toy robots. Compare Machine Worship, Deus Est Machina, Thank the Maker, Robot Religion (where the worshipers are mechanical). The Evas of Neon Genesis Evangelion are said at points to be a substitute for God, whatever that actually means. The explanation is that Angels possess God's Fruit of Life, while humans possess God's Fruit of Knowledge. EVAs can potentially possess both, as Angel/human hybrids that possess a human soul and an S2 engine. Rossiu's home village worships an old Gunmen, though the village elder knows it's nothing more than a simple mecha (and even pilots it to protect the village from another Gunmen that stumbles onto the village) and uses it to justify his population control Lottery of Doom. Chouginga Gurren Lagann, the penultimate mecha of the series, was explicitly described as "one who matches the Gods," as having power tantamount to a sub-Universe all its own, and is capable of near-divine manipulation of space-time. It also looks like a drill angel. There are people who list their religious views as "Gurren Lagann" (Or Kaminalogy). RahXephon was referred to this at some points. Not sure of the other versions, but at least one of the The Vision of Escaflowne manga versions called the Escaflowne a god. GoLion is thought of as one, even if not so in western equivalent Voltron. He tried to prove it too. It didn't go so well. In Mobile Suit Gundam ZZ, there's Moon-Moon, an isolated forgotten colony that drifted off into uncharted space, and its inhabitants with time regressed into a social, cultural and technological level along the lines of Mayincatec. Among other weird things, they worshipped a rusty old construction mobile suit as a god. The "White Doll" from ∀ Gundam is sort of worshiped as one. Granted, this was before they knew it was a mobile suit, and not just a statue. Setsuna F. Seiei of Mobile Suit Gundam 00 views Gundams with almost religious reverence because when he was very young, his life was saved by a Gundam. Naturally, the Gundam he eventually pilots is so powerful, it's not even a Gundam anymore but essentially a Super Robot. In the accompanying novel, it is explained that master-villain Ribbons allowed Setsuna to live because the little child saw the Gundam 0 -and Ribbons himself- as a God and it pleased his megalomaniac tendencies. Afterwards, Ribbons hacks Veda to allow young Setsuna to become a Gundam Meister. Which horribly bite back at the finale. The titular mecha from Space Runaway Ideon is referred to as a legendary giant god by the Buff Clan. Considering the Ideon's planet-destroying capabilities, it's a fitting title. In Gravion, Sandman calls his Humongous Mecha "a new deity for the modern age". As if that wasn't enough, its name is God Gravion. However, it's replaced by Sol Gravion, and Sandman's God Sigma Gravion becomes a sort of Sixth Ranger. The Ma-Shin, aka "Rune Gods" of Magic Knight Rayearth. It's unclear if they're actually worshiped, but they do occupy shrines and they're a part of Cephiro's mythology (even if few people know the entire myth). Scrapped Princess gives an example: The common people worship a woman who sided with humanity's enemies 5000 years ago as God, and believe the Peacemakers (AI-controlled Humongous Mecha that can brainwash you by looking at you) are angels. They also believe the Dragoons are demons. So the Humongous Mecha are on either side of the religion. Played with in Gasaraki. The TA/Fake mechas are ugly, purely mechanical looking and sounding, and while they're excellent weapons they're also get clogged by sand and are useless in certain situations, so they're as far from the Awesome Humongous Mecha as you can get. The Kugai on the other hand are referred to as Gods (or Demons, depending on who you ask), and compared to the TAs they're incredibly smooth, much more powerful, and scary. Tenchi Muyo! GXP (Episode 24+ spoilers): The Zinv-lookalike "Idol" mecha Seina gets thrown into was worshipped as the guardian diety of a small village — and Seina was the Chosen One to awaken it. In K.O Century Beast each village that has a guardian statue which in fact houses a robot dubbed Jinns. In Kannazuki no Miko, the Humongous Mecha are actually gods of Japanese Mythology. One of them is piloted by a nun. The Big O goes so far as to call giant robots Megadei, literally mighty gods. Then of course there's their boot up sequence: Cast in the name of God, ye not guilty. And the Shin Mazinger Zero manga implies Mazinger Z can become an abomination if its power is not harnessed for the good. In UFO Robo Grendizer, the titular Humongous Mecha was the robotic embodiment of the god of war of planet Fleed. Raideen was the protector deity of Lost Continent of Mu. It was foretold when the Age of Demons began, Reideen would awake and would battle them to protect the world. Needless to say, it happened. ''Tetsujin 28-go'' is actually mistaken for a god in one episode of the 1980 remake. In Gargantia on the Verdurous Planet, Kugel's mecha finds its way to a primitive Earth, where it is worshipped by a fleetful of locals. In Gunnm, there is a cult of Space Buddhists who believe that even androids can achive enlightenment. It was actually centered around the empty cyborg body of Don Fua who turns to have indeed developed god-like powers. A fantasy example: In Cerebus the Aardvark, a wizard transferred his soul into a giant golem and declared himself the god Tarim. Cerebus was running a messiah confidence scheme on the town at the time and got deposed when "Tarim" showed up. Cerebus eventually shot him through the head with a cannon. Perdido Street Station features a very creepy Deus Est Machina worshipped by a scattered but highly organised cult. It uses a corpse with the top half of its head cut off to communicate with people. Dark Is Not Evil Or is it ? The infamous BattleTech novel Far Country featured a tribe of primitive, birdlike aliens who worship a Locust Battlemech that was left on their planet by a marooned group of Mechwarriors. The Book of Revelation mentions the False Prophet constructing a talking statue of The Antichrist. Some theologians have hypothesized that it's a giant robot (or at least animatronic). More than one series has portrayed their mecha as gods. Hyakujuu Sentai Gaoranger has the literal Gao God, while the Kyoryu Sentai Zyuranger mecha combine into God and face off against the Devil. Naturally, Power Rangers plays this down to the point of non-existence. Save for Power Rangers Wild Force, whose version of Gao God (named Animus), according to Linkara is what happens if GoseiKnight was a Megazord as opposed to a zord, and didn't have the Goseiger to tell him not to go after humans for polluting the ecosystem. They never actually used the G-word, but he filled the same function as in Sentai. As the page quote used to indicate, the Titans of Warhammer 40,000 are acknowledged as god-machines even outside of the technology-worshipping Adeptus Mechanicus. To complicate the matter, some have literal churches built on them. Some have churches and shrines built for them. In 40k comic "Titan", after the said Titan Invictus falls into a warp rift and emerges in a totally different place, natives of that area worship what remains of the mecha as god. The Dungeons & Dragons setting Eberron has the warforged, a race of living and intelligent war golems. Now that the war is over and they are no longer needed, many of them started to create their own society in the middle of a toxic desert. This includes their very own religion, which revolves around building their own mecha god. And as the entire setting is completely under the Rule of Cool, they will probably be successful. Exalted has Autochthon, the Great Maker, one of the Primordials who created the setting's universe, and the one most focused on craftsmanship, artifice, and generally making stuff. He's also called the Machine-God, and he lives up to the name, with one of his bodies being an entire world of cogs, gears, pistons, wires, steam-filled pipes, and crystalline memory banks. BIONICLE's Mata Nui is an artificial soul placed inside a giant robot who houses the Matoran Universe inside him, ruling over the forces of nature and deciding over fates. Most of the inhabitants worship him as a god due to a glitch in their programming, not knowing that they are actually parts of his robo-biology. Mata Nui, however, prefers not to see himself in such a way and is actually a very kind leader, if capable of being somewhat inattentive at times. The so called "gods" of the Cuotl from Rise of Legends sure look like mecha. It is unknown whether they are actually aliens, alien robots, or aliens inside robots(which would actually make them mecha). The Reapers from Mass Effect count to a degree. They have nothing but loathing for those beings that worship them, but have no qualms about using their devotion. Legion: We do not view the Old Machines as analogues to deities. However, we have gained perspective on why others would imbue them with those qualities. Obsidian by Segasoft had an area literally called the Church of the Machine, which had a giant robot spider (an even-larger version of which played a key role in a previous chapter) as the centerpiece. The Bionis and Mechonis of Xenoblade are both mecha-like in appearance, and the Mechonis is a Humongous Mecha, with the emphasis on Humongous. The two titans have/have had civilisations living on and in them, respectively. Both of them are inhabited by a god but only the Mechonis's is actively worshipped - the Machina, the Machine People, are the only ones who are old enough to remember that the titans have souls, and are thus the only ones to remember that Zanza, the Bionis is destructive, while Meyneth, the Mechonis, is benevolent. Super Robot Wars Z3: Rengoku-hen gives one to Gunleon, including the followers chanting the lyrics of it's Leitmotif. When religious conflict on a planet of anthropomorphic foxes breaks out into open war in the furry story "The Last Aspect", the "orthodox" side decides to build a gigantic, intelligent war machine in vulpine form to both act as a symbol of their faith and directly oppose the "heretics" in combat. The project takes years to complete and its AI spends quite some of that time communicating with its designer and learning about the world...and when the machine finally goes live, it proceeds to curb-stomp both sides, force them to put an end to the fighting, and declare itself the new supreme deity by virtue of being the obvious physical embodiment of the one concept both sides were equally dedicated to despite their notional religious differences — War. Primus and Unicron are the Gods of Creation and Destruction respectively, with Primus being the progenitor of the Cybertron race (as well as Cybertron itself in some continuities). They are also both huge transforming robots themselves. 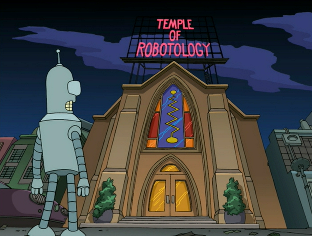 The Transformers: In the episode "The God Gambit", - the people of Titan worship a massive statue as a god, but this turns out to be a scam run by the priesthood. When the Autobots and Decepticons arrive on the moon, Astrotrain sets himself up as a more powerful deity. He provides the page quote during this time explicitly lampshading it. At the end of Beast Wars, Waspinator is left behind on Earth, where he gets to become a god to a tribe of protohumans. Brian Clevinger once related in an 8-Bit Theater newspost that he didn't really "get" why religious people got so hung up about that Jesus guy, until he asked himself "What if Jesus is their Optimus Prime?"